Emergency services attend the scene outside Parsons Green station in west London after a terrorist attack in London, Friday, Sept. 15, 2017. LONDON - A home-made bomb exploded on a packed rush-hour commuter train in London injuring 22 people on Friday, police said, in what was being treated as the fifth terrorism attack in Britain this year. Passengers on board a train heading into the capital fled as fire engulfed a carriage at Parsons Green underground station in West London after the explosion at 8.20 a.m. (0720 GMT). Some suffered burns while others were injured in a stampede to escape. The National Health Service said 22 people had been taken to London hospitals. None were thought to be in a serious condition, the ambulance service said. “We now assess that this was a detonation of an improvised explosive device,” Britain’s top counter-terrorism officer Mark Rowley told reporters. He said most of the injuries were thought to be flash burns. Rowley declined to answer whether the authorities knew who was responsible or if the suspected bomber had been on the train, saying it was a live investigation which was being assisted by the intelligence services. Pictures taken at the scene showed a white bucket with a supermarket freezer bag on the floor of one train carriage. The bucket was in flames and there appeared to be wires coming out of the top. “I was on second carriage from the back. I just heard a kind of whoosh. I looked up and saw the whole carriage engulfed in flames making its way toward me,” Ola Fayankinnu, who was on the train, told Reuters. Outside the station, a woman was sitting on a pavement with a bandage around her leg, while armed police patrolled. A Reuters witness saw a woman being carried off on a stretcher with her legs covered in a foil blanket. In 2005, 52 people were killed when four British Islamists carried out suicide bomb attacks on three London underground trains and a bus and this year Britain has suffered four attacks blamed on terrorists. Prime Minister Theresa May returned to London to chair a meeting of Britain’s emergency response committee later on Friday. “My thoughts are with those injured at Parsons Green and the emergency services who, once again, are responding swiftly and bravely to a suspected terrorist incident,” May said. Foreign Secretary Boris Johnson said people should “keep calm” and continue their lives as normal. British police have not said anything about who could be behind the attack. A Reuters witness saw armed police scouring a stationary train and a bomb disposal unit at the scene. 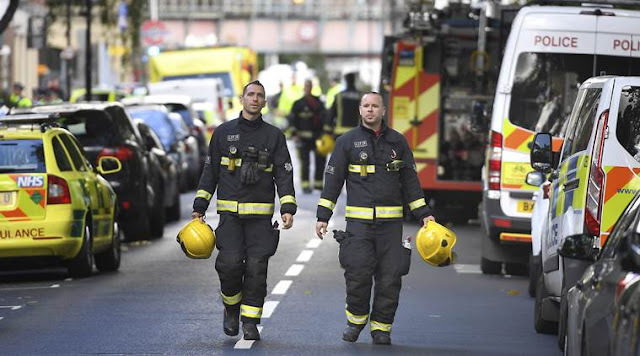 London Ambulance said it had sent “multiple resources” including its hazardous area response team to the scene and the fire brigade said it sent six engines and 50 firefighters who had helped evacuate another train at the station with 253 people on board. Transport for London said there was no service on the western part of the District Line which runs through Parsons Green. In March this year, a man drove a car into pedestrians on London’s Westminster Bridge killing four, before he stabbed a policeman to death outside parliament. A further 22 people were killed in a suicide bombing at a pop concert in Manchester in May and the following month three Islamist militants drove into pedestrians on London Bridge before stabbing people at nearby restaurants and bars, killing eight. In June, a van was driven into worshippers near a mosque in north London which left one man dead. On Thursday, figures showed there had been a record number of terrorism-related arrests in the last year and earlier this week Britain’s most senior counter-terrorism officer Mark Rowley said there had been a shift-change in the threat. In the three years until March this year, police foiled 13 potential attacks but in the next 17 weeks, there were the four attacks while the authorities thwarted six others, Rowley said. A home-made bomb exploded on a packed rush-hour commuter train in London injuring 22 people on Friday, police said, in what was being treated as the fifth terrorism attack in Britain this year.